Hawkshead Hill is a hamlet in the South Lakeland District, in the county of Cumbria. It is in the Lake District National Park. 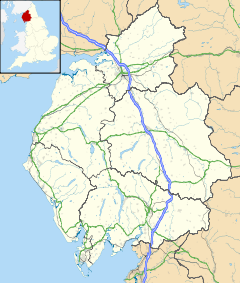 It is located on the B5285 road about a mile west of the tourist village of Hawkshead and about four miles east of the large village of Coniston. It is a few miles away from Windermere and about three miles away from Coniston Water and about three miles away from the Old Man of Coniston. Almost directly to the south is Hawkshead Hill Park. Wikimedia Commons has media related to Hawkshead Hill.